“In my books, the truth is stated, barricaded by a ‘thus saith the Lord’. The Holy Spirit traced these truths upon my heart and mind as indelibly as the Law was traced by the finger of God, upon the tables on stone” (Ellen White, Letter 90, 1906). “I do not write one article in the paper expressing merely my own ideas. They are what God has opened before me in a vision … in these letters which I write, in the testimonies I bear I am presenting you that which the Lord has presented to me” (Ellen White, 5T, p.67). There are many things she copied from Paradise Lost which are not found in this book (Story of Redemption), but can be found distributed in her other writings. “Paradise Lost” (1667) is an epic poem composed by John Milton while he was blind. Its theme is ‘the fall of man’ based on Genesis story and its aim is ‘to justify the ways of God to man’. It also narrates the story of rebellion and fall of Lucifer; creation of Adam and Eve, and the redemption of mankind through the supreme sacrifice of the Son of God. “John Milton’s [1608-1674] literary and political writings have had a profound and lasting impact on our culture…Paradise lost served as a well of popular teaching, mediating the Bible for generations of English Christians. 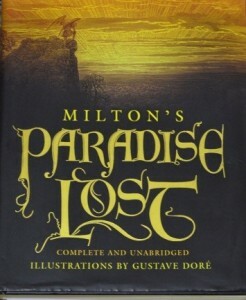 The imaginative richness of the world Milton creates in paradise Lost has served as a leaping- off- point for poets, novelists, composers, film makers, and artists of all kinds” (Christ’s College, Illustrating Paradise Lost). “Many artists, and religious teachers from a wide variety of backgrounds have blended his [Milton] concepts into their own art works and writings” (Answers about Angels: Sources of extra-biblical stories, legends, myths, and speculation about angels). “Unfortunately, many Sabbatarian authors…of the past 150 years, [Ellen White included] seem to have absorbed these embellished versions and incorporated them into their own writings, rather than return to the simplicity of what is actually in the Bible…In each of these scenarios painted by the authors, virtually none of the embellishments have any support in the Bible account at all” (Answers About Angels: Lucifer Mythology in Sabbatarian Circles). “For if we under the gospel are to regulate the time of our public worship by the prescriptions of the decalogue, it will surely be far safer to observe the seventh day, according to the express commandment of God, than on the authority of mere human conjecture to adopt the first” (John Milton, A Treatise on Christian Doctrine: Compiled from the Holy Scriptures Alone (translated by Charles R. Sumner), 1825, p. 611). The books, Paradise Lost and The Story of Redemption, have striking parallels on similar themes although they were two centuries apart. This is an intriguing fact. How was this possible? Did Ellen White receive this information from God? Or, was it copied from Milton’s ‘Paradise Lost’, which if proved, would render her claims false? There can be only three possible sources: God; Satan; or human imagination. The purpose of this paper is to share what I have discovered in this comparative study which I believe would be helpful to Adventists who are earnestly looking for answers on the issue of Ellen White’s plagiarism. Before I proceed any further, I would like the reader to be aware of Ellen white’s claim that she did not read Paradise Lost until she had completed her own version of the great controversy as shown by God. “…Elder Andrews said, Sister White, have you ever read Milton’s Paradise Lost?” “No”, she replied. “Have you read any of his writings? Again she replied, “No.” A few weeks later he bought a copy of Paradise Lost, and read to Father and Mother some of Milton’s descriptions of the experiences of Lucifer in his great rebellion. Later on he bought a new copy which he had purchased and gave it to mother. She thanked him for it, and looked at it a few minutes without opening it, put it on high shelf in a cupboard built in back of the stove under the chimney support. There the book lay many days and several years… I never saw Milton’s poem in her hand, and never saw her reading it. I never heard her refer to the book, except on one or two occasions, when she stated to visitors what I have stated above, and said that she felt that she ought not to study what anyone else had written regarding rebellion in heaven until she had written out very fully what had been revealed her.” (W. C. White, Address to Faculty and Students, At Advanced Bible School, California, 1935). 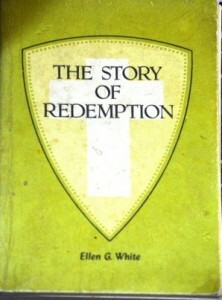 This section covers the first nine, and the forty fourth chapter of The Story of Redemption (also included in the appendix the parallels not found in the Story of Redemption, that have been traced in other writings of Ellen White), and Milton’s Paradise Lost, chapters I – XII.